Most of the time we only see the refined, polite, and glamorous part of our applauded Hollywood inhabitants, but some of them have a dark side. You don’t expect them to possess a corrupt facet but there are obscure chapters in their story that we are about to lay out for you, And no no no! We are not judging anyone just because their sin is different from ours, the Guru only presents the juicy facts, and you, come to your own wrap! In earlier times there were some arrests that seemed to be taken out of a movie, like in 1938 when Sinatra “carried on with a married woman“… aka Adultery! Or in 1961 when Al Pacino and a couple of his fellow cast members were arrested for suspicion of attempted robbery, just because they were wearing their costumes outside the set. Nowadays crimes are less innocent and there seems to be a destructive behavior behind most of them. Go through our terrifying summary of the last 10 years of the World of entertainment’s most deplorable episodes. Only our belated hero, David Bowie, a legend the world is still grieving, could manage to look this fly in a mug shot! 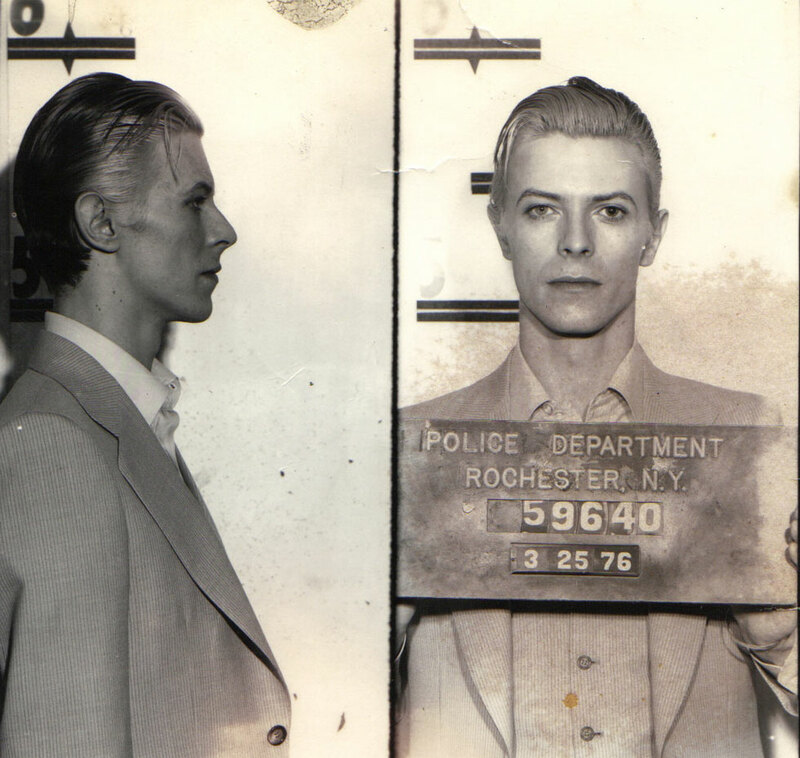 What brought Bowie to the Monroe County Jail? Precisely 182 grams of marijuana, that were found in his room at the Americana Rochester Hotel on a Saturday night in March of 1976, after a concert. Right after he got released the next morning on $2,000 bail, and even though he was to remain in Rochester, Bowie, who feared he heavy penalties imposed when concerts were cancelled, left town to go to his next concert in Springfield, MA. His lawyer requested the court’s indulgence for the singer, who had never been arrested before, for a felony that was punished with 15!!! years of prison. An otherwise eventless night out of a long tour, will forever be remebered as the night David Bowie spent the night locked up! And no! This is not how David looked at 3:00 am when he was dragged to prison, this shot was taken in May of the same year when the charges were dismissed. The British singer never returned to Rochester after that anecdotical night, but wherever his soul rests right now, he must be smiling down on the town that caught him being bad!